DarntonB3 was appointed as Architect, Project manager, Interior designer and lead consultant in November 2013 to undertake the re-build of Airedale International Air Conditioning Ltd £37m Headquarters in Leeds following a fire at the existing facility. 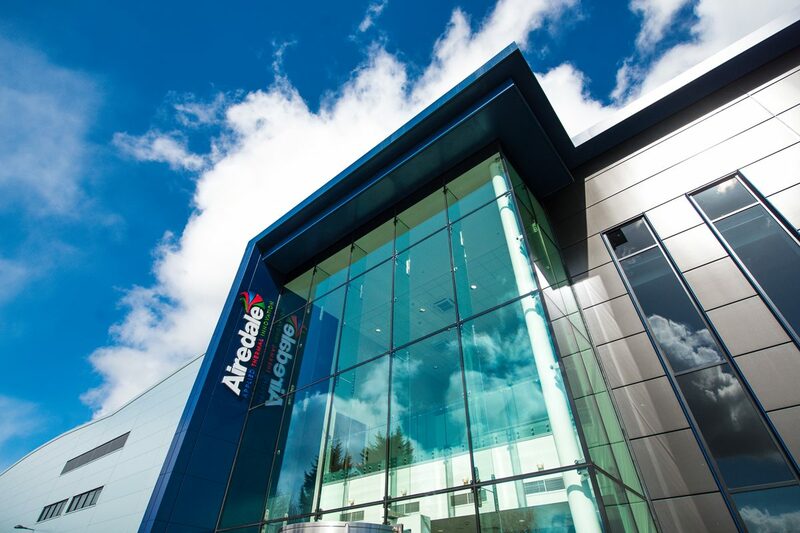 DarntonB3 had previously worked with Airedale International Air Conditioning Ltd on their Technology Centre and Entrance re-configuration on the same site. Working closely with the senior management team at Airedale, DarntonB3 helped formulate the design brief to deliver 23,000m² of manufacturing space, offices for design and management together with a state of the art Research & Development Laboratory. The scheme required a BREEAM’ Very Good’ rating. Due to the heavily sloping nature of the site, the previous facility was stepped in a number of locations to take account of the site falls. To eliminate this, the siting of the building was very important and through the use of 3D modelling software, DarntonB3 was able to re-configure the levels of the site so that the main mass of the building would be concealed from public view and all aspects of the manufacturing could be kept on a single level. This enabled the creation of an under croft car park, which further limits the impact of the development on the surrounding areas. Careful consideration was paid to the design of the front of house visitors and staff areas, providing real impact as you approach the entrance and this quality of design is followed on throughout the scheme. DarntonB3 worked closely with the Airedale on all aspects of the interior design, selection of fixed and loose furniture and design of number of bespoke furniture pieces for the reception, boardroom and meeting rooms. Sustainability is at the heart of Airedale’s core strategy and the building design reflected this. In the manufacturing facility and offices a number of Kalwall panels have been used to bring large amounts of natural daylight in and with low energy lighting, roof lights and heat recovery installed throughout the facility, the building’s carbon footprint is kept as low as possible. The scheme has achieved the requisite BREEAM rating of ‘Very Good’ which further demonstrates the sustainable credentials of the scheme. With over 1,000 tonnes of steel and 20 miles of pipework installed, Building Information Modelling was a key tool in the success of the design. From the early design stages the design team worked in a BIM environment enabling the detailed mechanical design to be integrated with the structural and architectural elements early on. This enabled us to walk through the facility with the client and fine tune the design around the process requirements. Due to the complicated nature of the mechanical design, working in a BIM environment was instrumental in limiting the amount of co-ordination issues on site. The scheme completed on time and budget and has been met with fantastic feedback. The official opening by the Princess Royal was held in May 2016. From single units to large-scale, complex process-driven industrial developments, DarntonB3 has experience of design and management of projects to successful completion. Co-ordinating inputs from around the globe, integrating specialist manufacturing and process machinery, our teams ensure smooth transition from initial concept to efficient operational plant and facilities. DarntonB3 also have a track record developed in the design of controlled environment production and laboratory facilities. We possess experience and skills developed through working with major pharmaceutical and production companies, worldwide, to create controlled and clean environment facilities. Knowledge of specialist requirements for services and the coordination of specialist suppliers aid team integration.